K-Swiss Trainers + Free Running – Kitmeout Designer Clothes – Fashion Blog & Fashion Forum. The K-Swiss Ariake is the first shoe inspired by and designed specifically for Free Running. Worn by one of the founding fathers of Free Running Sebastien Foucan, the Ariake pioneers an entirely new category of original urban sneakers. Sebastien Foucan, who is now a K-Swiss Brand Ambassador, was one of the pioneers of free running that originated in Paris. The star of free running films Jump London and Jump Britain, Sebastien recently wowed the world with his skills in the opening scene from Casino Royale when he was chased by 007 Daniel Craig through a breathtaking array of obstacles. 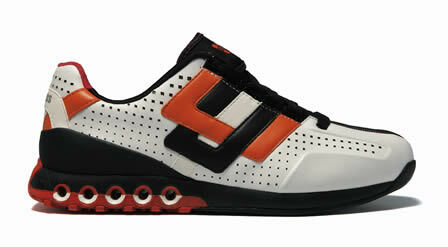 Bold, technical and fashionable, K-Swiss named the Ariake after the renowned Free Running hotspot in Tokyo. The design of the shoe utilises the insight of the activity from some of the worldâ€™s top Free Runners, to produce something thatâ€™s not just fashionable but also highly functional. The Ariake also has an advanced heel grip and sticky rubber sole that will give Free Runners extra stability when tricking, along with an ingenious D-ring lacing system and a hidden pocket for tucking laces away to avoid tripping. K-Swiss is now dedicating itself to the heart of the free running community with plans to run a series of regional free running workshops across the UK, collaborating with Team Traceur â€“ the UKâ€™s most prolific free running team â€“ and Sebastien Foucan to help Free Running grow in the UK without losing its independence and positive philosophy.Â Â The Ariake is rooted in the heritage of Free Running but is also its future. were can i get some of these for cheap? were can i get a pair of these trainers cheap?? need a pair of these can some one please let me kno were i can get some cheap. where can I get them in orange??? ?